Can't believe the newer, pricier TX-NR636 does! Just tried via my old Pioneer VSX-822 and no problems. I'll try the link you posted, thanks. Update: Onkyo 636 has no such hidden setting by pressing 'DVR' and 'Display' at the same time. Tried every input button and 'Display' just in case. In 636's setting, turned off 'Display OSD' setting, but the blanking out still happens. May just consider another AVR after some research (proper video through, proper HDMI, price, etc.). Or, doing something like this, similar to @BubbleBobble. That is a complicated setup with a flaw. If you would try this with (for example) a PS4 you would get 2.0 audio only and no 3D support. A splitter will gather info of both your projector & AVR and gives feedback to your source, which is a selection of the lesser of both feature sets. I only need to set the port of my switch if i want to watch a source (Projector, TV and AVR are only using 1 input). Thanks, will consider. Adding 3 HDMI thingies in between media players and display seems like you might introduce other issues (like snow, signal loss, etc.). Would be a potential issue in my proposed chart too. No expert in this though. Also considering a different AVR, possibly Denon AVR-X2100W. Don't need ATMOS or DTS:X for a while. Hahaha i feel your pain. Remember I also have that "expensive" Epson projector which should never blank out considering that pricetag. Also you don't add 3 hdmi thingies You already mentioned using a switch and a splitter. I just recommend to add the dr.hdmi. None of those 3 devices do any processing (no changes or adding anything) to the signal, unlike an AVR (like @popcornmix said earlier). The signal entering your projector will be identical to your source sending it. (2015-10-18, 21:39)BubbleBobble Wrote: Hahaha i feel your pain. Remember I also have that "expensive" Epson projector which should never blank out considering that pricetag. Thanks for your help; appreciate it. Anyway, ordered a Denon AVR-X2100W from a place with great return policy, so hope it works better with Pi2. 1080i29.97 H264 mkv file - MMAL deinterlacing not working with latest build. I think you're supposed to press the "Return" button and not the "Display" button. On my TX-NR828, I can press BD/DVD and Return at the same time and nothing happens. When I press CBL/SAT and Return at the same time, I get a display thingy on the AVR about HDMI Through. Pressing Return multiple times steps through various "time" amounts from seconds to minutes or Off. I'm not sure what that is doing. I too have noticed banding on my Projector, but I didn't think to blame the Onkyo for it. I figured it was the source material that was at fault. I have the AVR set to upscale everything to 1080p, but didn't think it was doing anything. When I watch TV (from HDHomerun), the Pi is already upscaling the 720p channels and the 1080i signals to 1080p so I didn't think the AVR was doing anything. I will now be doing some experiments later to see if it is responsible for the banding I see. I really like my Onkyo most of the time, but I've read some terrible things about faulty HDMI (I have an older 606 that hasn't failed yet). I also get some trouble from it when I turn on the Kodi option to adjust the refresh rate. I get a second or two of black nothingness while the AVR and/or projector resync. Just out of curiosity, why do you split the signal from the Pi? I just run my Pi straight into the AVR on the CBL/SAT input and let the AVR peel off the audio. Are there times that you let your projector playback the sound so that you don't have to turn the AVR on? I never use the sound capability of my projector. 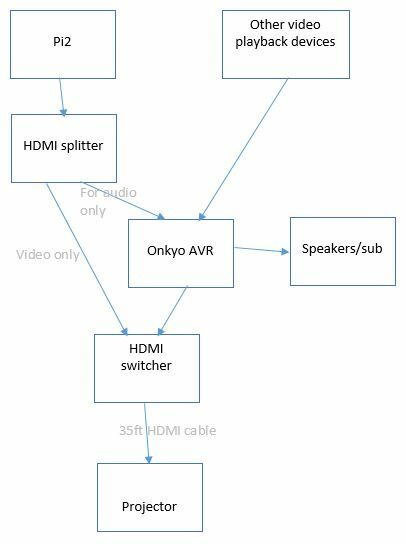 I have no HDMI splitters or switches in my setup, just the Onkyo AVR. EDIT: Never mind on that last question. I see that you "might" do that to avoid the AVR mucking up the video from the Pi. - when leaving a 3D movie a short 'bleep' comes out of the front speakers. - when you stop a 3D movie and press play again the gui asks to continue on the time-stamp you stopped watching. If you select that it will continue on that time point but it plays in 2D. - in System->settings->system->video output->refresh rate. When you select a new refresh rate you are given a yes/no option. When timed-out it falls back to your previous refreshrate but the gui lists the refresh rate you selected (and not the real refresh rate that has fallen back to). - when pressing play on a BDMV folder give an option to select 3D in the simplified menu. +1 to BubbleBobble's points, but also chapter support for 3D ISO's. Thanks. (2015-10-20, 01:38)afremont Wrote: I think you're supposed to press the "Return" button and not the "Display" button. On my TX-NR828, I can press BD/DVD and Return at the same time and nothing happens. When I press CBL/SAT and Return at the same time, I get a display thingy on the AVR about HDMI Through. Pressing Return multiple times steps through various "time" amounts from seconds to minutes or Off. I'm not sure what that is doing. Thanks... just tried it, and doesn't work with Onkyo 636.
airplay music still doesn't work for me when trying to airplay from spotify app to kodi on RPI2. i'm using the 2015-10-19 build. People are reporting issues with 3D ISOs played as 2D (monoscopic) in the Zidoo thread ("playback stops after a while"). (2015-10-20, 20:55)menakite Wrote: People are reporting issues with 3D ISOs played as 2D (monoscopic) in the Zidoo thread ("playback stops after a while"). ... about "playback stops after a while". If you say yes to continue a stopped 3D video it will play as 2D. I mentioned this a few posts above. also you need to hand-select the 3D playlist from the simplified menu. Can you link the thread? or specific post of issues? I have been trying a number of 3D iso's on build #1019 and i was very enthusiastic. I believe he's referring to OSD -> 3D -> Watch as 2D (or preferred 3D mode set to "2D - monoscopic" in settings). Select "Play in 3d mode" and then try switch to 2D via the OSD.